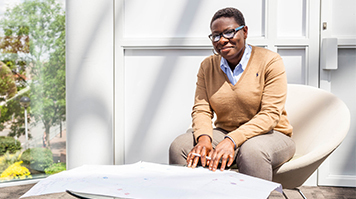 As a Chartered Engineer with Atkins Global, Sekinat Saka is responsible for developing and delivering innovative lighting schemes. "When I drive around the city with my children, it’s great to be able to point out the projects I’ve worked on. For example I designed the road lighting for Euston Circus, the junction between Newington Butts and Walworth Road at Elephant and Castle, and part of Old Street’s award winning ‘Promenade of Light’. I’m currently working on detailed lighting scheme for the new A14 between Cambridge and Huntingdon, which is a massive project. Good lighting can have a real impact on communities, improving safety, reducing night-time accidents and boosting commerce. I find it very rewarding. Engineering pays well too. That’s not my main motivation but it’s good to feel your work is valued. "Engineering is a career I’d recommend to anyone with the right skills and interests. As with any job, your passion makes a huge difference but you also need great attention to detail and the drive to innovate and think outside the box. It’s vital to have a problem-solving approach, because that lies at the heart of the job. Lighting engineering is more creative and design-focused than people realise, but it also requires the ability to think on your feet. For example, if something on site doesn’t fit as planned and it’s holding up an expensive project, it’s down to me to find a solution fast so construction can continue on schedule. "I work in a team of 20 – and only two of us are women. There are more young women coming through and I’m keen to encourage them. If you study engineering and have a passion for it, you can go far. The most important thing is to speak up. Women need to make themselves heard. In my experience if you can be assertive and professional, and push the boundaries when you need to, you’ll be treated with respect. If I felt in the past that men were talking over me in meetings I’ve never been afraid to say “Hold on, it’s my turn to speak”. Now I’ve got their respect and they listen to what I have to say. It’s not a man’s world and it’s important that we don’t act as if it is. "I didn’t have a clear career plan but was always interested in engineering. I was born in London but my family moved back to Nigeria when I was three. I returned to the UK aged 25 with an HND in Electrical and Electronics Engineering and 18 months’ work experience in the oil and gas industry. I wanted to take a degree course but didn’t know where would be best to study. I went to check out LSBU because a friend had enrolled there. When I realised how close it was to my home, I decided to apply too. I had a young child at the time and was doing evening work at Tesco in Elephant and Castle so an easy commute was important. I liked the variety of topics the Engineering course covered, as well as the fact that they offered me a two-year course to convert my HND to a degree. I chose LSBU for convenience but it gave me so much more. I wasn’t expecting the incredible levels of help and support I got from the staff. For example, I was really interested in the telecoms module of the course, and the lecturers went out of their way to get me up to speed despite the fact that I’d grown up in Africa with no experience or real understanding of broadband. As it turned out my first contract was with BT, so the hard work paid off. The opportunities at LSBU for career development and networking and the follow-up I was given after graduation were also amazing. I’m not sure I’d have got that level of support anywhere else. My experience was so good that my husband also chose to do his degree at LSBU. LSBU continues to be a part of my life, even though I went on to do a Masters at Queen Mary University of London and am now on my fifth graduate job. I got my first contract at an LSBU careers fair while I was still studying and after graduation I made great use of the alumni services, especially the CV clinic. I’ve since attended workshops to learn “soft” skills for the workplace. I found the communications skills workshop especially helpful and I still sometimes consult the notes I took. Now I’m starting to think about giving something back to the place that has given me so much and have just been involved in a round of mock interviews as a volunteer. I hope to do some mentoring work with LSBU students too. My advice to anyone studying at LSBU now is to get networking for encouragement and inspiration. You don’t need to wait until you finish your studies. Keep your eyes open for events that interest you and get talking to people. You won’t regret it."